It’s been so hot here lately so we’ve been eating a lot of finger foods for dinner. 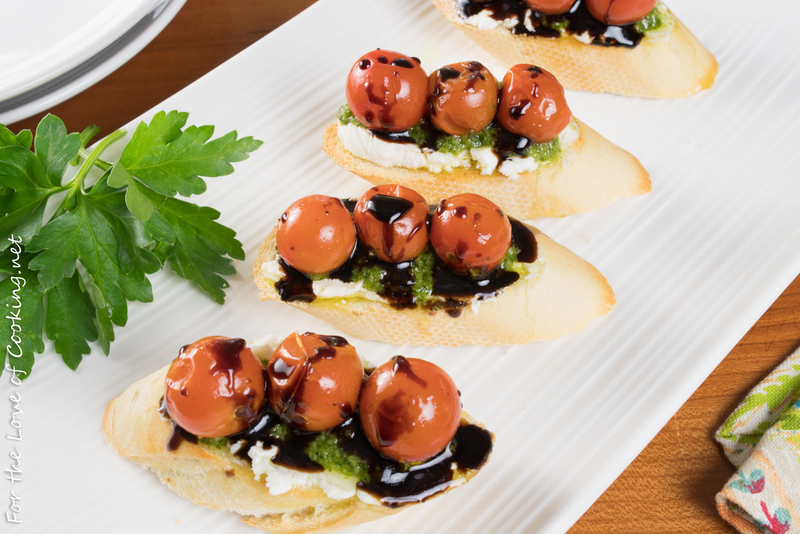 I served these delicious crostini with goat cheese, pesto, roasted tomatoes, and a balsamic drizzle on a recent evening before my daughter’s upcoming trip and we all LOVED them. My daughter has been studying Mandarin for three years and was one of the lucky students chosen by Portland State University’s Confucius Society for a two week trip to Beijing, Shanghai, and Suzhou to immerse herself in the Chinese language & their culture with other Mandarin students from throughout Oregon. It is very exciting for her and a once in a life time opportunity, but I’ll admit that it has been very hard for me. She is only 15 (although she would say 15 1/2) and this is her first trip away from home…of course it had to be all the way in China! Thankfully we have raised a very strong, responsible, and respectful young lady and I know she is going to have an amazing time and the memories from this trip will be cherished for a lifetime. I also know I won’t be sleeping well for the next couple of weeks so bear with me. I do think I will be making lots of comfort food though so stay tuned. Send good thoughts her way if you can. Thank you! Make the pesto – click here for the recipe. 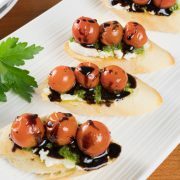 Place the grape tomatoes and sliced garlic in a baking dish then drizzle with the olive oil. Season with sea salt and freshly cracked pepper, to taste and a pinch of crushed red pepper flakes. Place into the oven and roast for 12-15 minutes, or until ready to burst. Remove from the oven and set aside. Cut the baguette into thin slices then place them on a baking sheet. Place them into the oven and bake for 5-6 minutes, or until toasted and golden brown. Remove from the oven and allow to cool for a bit. Spread each baguette slice with some goat cheese. Spoon a bit of pesto on top of the cheese then top with a few roasted tomatoes followed by a drizzle of some balsamic glaze. Make the pesto - click up above for the recipe. 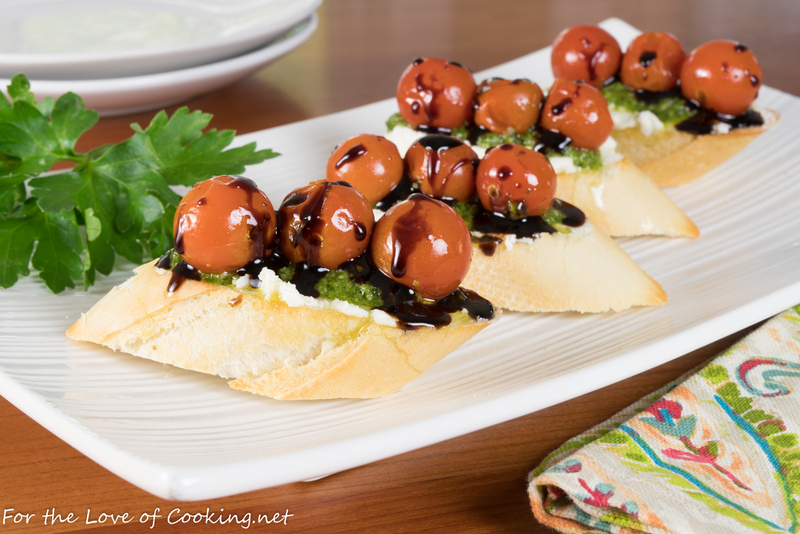 Place the grape tomatoes and sliced garlic in a baking dish then drizzle with the olive oil. Season with sea salt and freshly cracked pepper, to taste and a pinch of crushed red pepper flakes. Place into the oven and roast for 17-20 minutes, or until ready to burst. Cut the baguette into thin slices then place them on a baking sheet. Place them into the oven and bake for 5-6 minutes, or until toasted and golden brown. Remove from the oven and allow to cool for a bit. 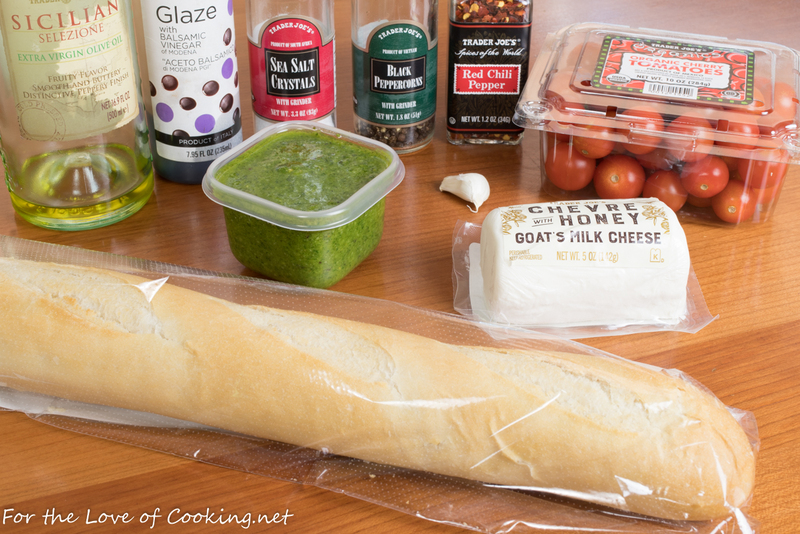 Spread each baguette slice with some goat cheese. Spoon a bit of pesto on top of the cheese then top with a few roasted tomatoes followed by a drizzle of some balsamic glaze. What a great appetizer – especially for the summer. Oh my gosh, I would be a nervous wreck!! You’re a stronger woman than I am. i’m not sure i could handle going to china myself, much less have my daughter go without me! you must be raising quite an independent lady!